I have been meaning to write something about my experience of sustainable training and working with injury for some time, as working with this has taught me a great deal about the Feldenkrais Method. I came out of physical theatre aged 40 and since then I have been supplementing my feldenkrais practice with barefoot running and, for the last 8 years, a demanding form of traditional Okinawan karate. At my age especially I have had to pay a lot of attention not to end up injured and out of both activities quite quickly and it is important for many of my clients too. I am not immune to injury. 20 years ago I tore the cartilage in my right knee badly enough to have to have a sizeable chunk removed as it could not be ‘tidied’. My rectus abdominus muscle herniated down the midline when I gave birth 13 years ago and has never entirely joined up and I damaged nerves to my right foot when I was 15 leaving it a little insensitive and unresponsive. I also have a mild scoliosis which is not enough to be very visible to the lay person but is the kind of twist that any professional picks up immediately and gets excited about, as it lies at the heart of many of my challenges. And yet I run up to half marathon in very minimal shoes or totally barefoot and am now training for my black belt which means I train most days in some way. Sometimes very hard. 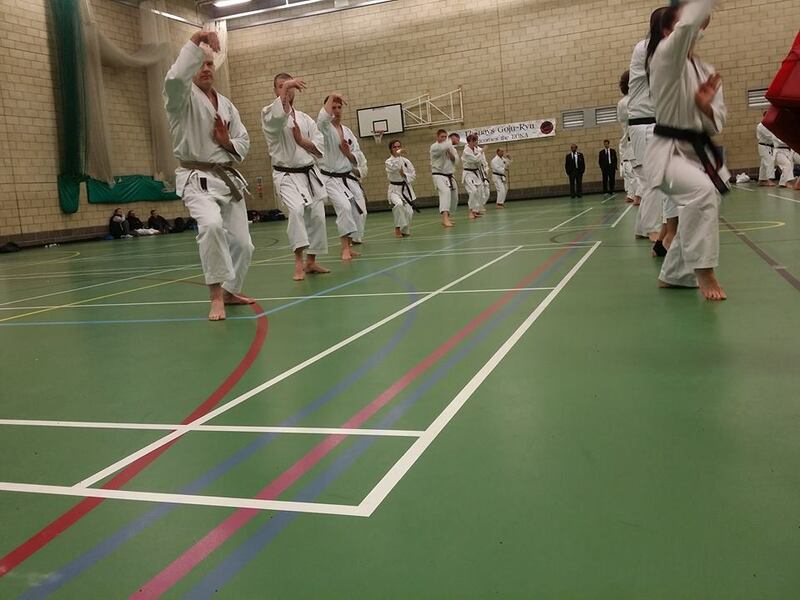 Karate training involves contact and conditioning at various degrees of hardness and a certain amount of fighting as part of technical, strength, speed and endurance training. Its not easy and if you have done the maths you will know that I am not in the first flush of youth so sustainable training is pretty important to me to stay in the game – yet I see many much younger people injured and in need of a re-think too. I could talk about pacing, rest and just not over-training – all of which is clearly important – but actually I want to talk about something else. The fundamental deal for me is this: Every time you challenge your system with a higher, longer, more intense level of training the fundamental building blocks of how you, personally ,organise your whole self in all movement will probably have to improve too. Its not just a matter of strengthening muscles, tendons or even bones, even though that is, of course, part of the picture. We all have habits and patterns in the ways we do things which we have developed from the moment we were born, and it may be that these are good enough to get you to level x, but not to level y. Just exercising won’t always do it, because even if you train in a well-rounded way, you are likely to develop within the deeper patterns you have – and they may not be good enough any more for what you want to do now. I was curious to see whether I could learn enough to improve my basic functioning yet again so that I could train usefully – and without discomfort. The challenge of pain and the desire to run and do karate would be my teacher. So I started to find out what was involved in my complaining knee: how my ribs on the right were still brought together and twisted by the scoliotic pattern and needed to open up more; how the top vertebra in my back needed to slide better, how the right side of my pelvis needed to learn to drop around the head of the femur better instead of sitting to the inside. I worked on waking up my reluctant right foot. I looked for how to open up my solar plexus and lengthen through the front right side without tightening my lower back on that side more. I worked a lot with foam rollers – not only to ‘roll out the muscles’ but to re-educate and feel. I used tiny ones under my feet (thanks to Shelagh O’Neill for the idea of cutting up swimming noodles); medium ones to sit astride and feel the insides of my sit bones as a I rolled to drop one hip and sink around the outside of each femur in turn.I sat with only one sit bone on a chair and sank my other sit bone off the edge feeling how my spine followed and lengthened on that side all the way up to my neck. I stood on bigger rollers to find the balance points through my knees and feet. I also spent time standing and pushing down through my knee at different angles into my foot to find and feel clearly a secure connection to the ground – and working with simple classic Feldenkrais lessons like lying down and rolling my pelvis very slowly on the floor, feeling every shift around my legs and the effect in my feet back, ribs and head. THEN I would try a one-leg squat or something to see if everything stacked up differently in a classic ‘exercise’ too. Invariably it did. 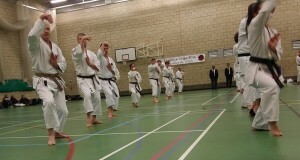 Often I would go to karate against my better judgement, warn Sensei Kev that my knee hurt and that I might have to stop. Then I would fiddle about a bit in any quiet moment of the session playing with my knee/foot connection or my right side, and listen to myself carefully while training until at some point it would all start working nicely with no discomfort so I could just go full speed without worry. I would go out better than I came in. Same kind of thing with running. Of course I am still working with many of these aspects of myself and probably will for many years to come. I expect to keep re-organising as I train always. However my knee is no longer an issue and hasn’t been for many years. I was reminded of all this though, not just by my current issues in teaching, but because just recently I felt sharp pain at a certain point in the front of my shoulder joints. I recognised it as significant and I know from some of my clients’ experience that it can lead to tendonitis and muscle tears. No way will I be heading there. I have been training for my 3rd degree brown belt so training has been intense and as I am now training for black that isn’t going to let up. It did make me sigh as I don’t really want to have to deal with it. After all those injury free years I have recently had to sort an impact injury to my right wrist which took me 6 months of working with all the movements of my lower arm bones, the tiny bones of the wrist and the long bones to each finger in the hand – and strapping it to train. I have just got it pretty good again and am now back to handstands and all the rest. But hey. Here we go again. It’s a new teacher. I learnt a lot about my knees and ankles and their relation to pelvis and back before; I learnt a lot about wrist bones and hands more recently, and now I will learn more about my shoulders. I will come out better organised and able to train better. And hopefully I will be able to use what I discover to be a better teacher. Or at least that is my plan. Because how do you teach this approach to someone else? If I said that to explore this new pain I sat on the floor with my hands beside me and minutely pulled my shoulder blades together until I felt the pain in the front of the shoulder joints and then switched to minutely moving the top ribs a little forward and a little back so that my shoulder blades were passively moved only and the pain went, would that make sense to you? Could you do it? Even if I used my hands to help you would you know what to listen to? It is not easy and it takes diligence on the part of the learner. The ribs and the shoulder blades form a sliding joint. Lack of movement or adaptation in one inhibits the other, but to feel that relationship in a meaningful way means paying a lot of attention. I did many kinds of movements in many different positions noticing that if I tightened my shoulders at any point the pain would come, and realising just how much I needed the adjustment in my ribs and back to support the movement of my shoulder blades and not pull on the joint. I knew this before, but going to a new level of training I need it to work better. I had to go minutely and listen very carefully to find the patterns of movement that do not include the pain. Then I went to karate training and listened to what I did with my punch. I really thought about my ribs and shoulders blades stabilising at the back and listened carefully to leave the front of my shoulder quiet – which wasn’t easy, I noticed. I messed about in the pauses as I had done with my foot. It was Ok. My ribs around my shoulder blades were achy for a while after training but no pain in my shoulder joints. There is further to go. I continued with this kind of exploration today and then went out and smacked the punch-bag, carefully first and then full tilt. A lot. Nothing hurt. It’s the evening now and while I can feel it isn’t right yet, nothing actually hurts. This kind of process is a hard thing to learn, but it is what we do in endless Feldenkrais lessons bit by bit over time. We gradually discover how to listen, explore and adjust. We learn how to learn. Its really hard to help people get curious and involved enough in their own learning to help themselves train sustainably or get out of injury, but that is the job because it works. And I would add, EXPECT to reorganise every time you up the level of your training. If you expect to have to and you learn to listen to yourself, you will avoid trouble OR you will hear the first twinge that warns you to get learning more. You won’t have to get to the full blown pain that keeps waking you in the night and sends you to the doctor. Pain – even a little pain- is a signal not to be ignored. Eventually you work out that this particular pain is not as significant as that one, but you don’t learn that through ignoring it. Listen carefully. Learn from it and work with it. It is not easy and it takes a lot of practice. A lot of Feldenkrais lessons helps.